Change is inevitable in all aspects of life. Mostly everything grows, evolves or transforms altogether into something new. Not so long ago we’ve witnessed a massive change in the way the #WordPress platform and managing it will look going forward. It’s not simply a visual change either, the whole approach to building pages, inserting content and applying bigger and smaller tweaks has gone through a complete overhaul. As it was proven many times before, you can fight change, but you can’t stop it – it’s coming and you better learn to adapt. 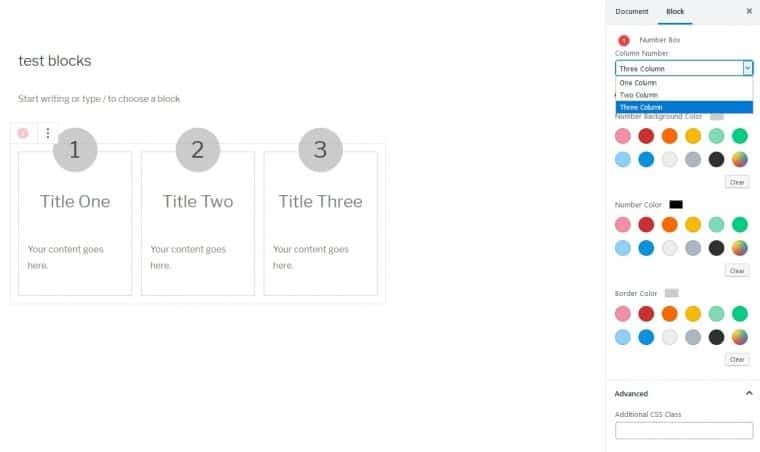 If you’re one of many WordPress users who have already accepted the change and made the switch from the classic editor to Gutenberg, you’re familiar with the block principle of building your posts/pages. This system isn’t perfect yet and maybe never will be, but in order to get used to it, there are many plugins that help immensely in the transition from classic to blocks. Ultimate Blocks is one of those plugins. Adding much-needed custom blocks to your database it expands the default lineup you’re present with after the switch. All the blocks that are added are easy to use and very precise in what they do. You won’t be stumbling around trying to find something that turns out not to be there. Every block represents something that was missing or overly complicated to use in the default editor making it a breeze for you to customize your content more efficiently. To top it all off, in the end, it also looks better. As of writing, there are 16 blocks available, but that number is always growing. New blocks are added and old ones are improved at regular intervals – going from initial release to version 1.1.3. in under a year proves this. We’ll go through all the blocks available right now in short snippets just to give you an idea of everything you’ll be getting. It can’t get much simpler than a notification box. If you ever have the need to point a part of the text out this is the block you’ll use. It comes in three standard colors: blue – for information; red – most commonly for an error of some kind; green – an operation has been successfully completed. Testimonials are used most commonly on the bottom of articles that give a picture and quick biography or something interesting about the author. Their function is to either emphasize the authors’ expertise in the matter or to simply make him more relatable to the readers. Used primarily as a marketing tool, a call to action is tightly connected to promotional events. You’re having a sale and after presenting the details you put in a call to action, so your customers can immediately take advantage of it. It’s essentially a great tool to get your customers to act quickly not delaying their purchase. Not much to say about this one, technically it’s classified as a block, but it’s actually a line that separates other blocks. There are no editing options available. The number box is a block that adds up to three numbered columns. It can prove useful if you’re listing things such as products or key features. Best used when bullet points just aren’t enough. 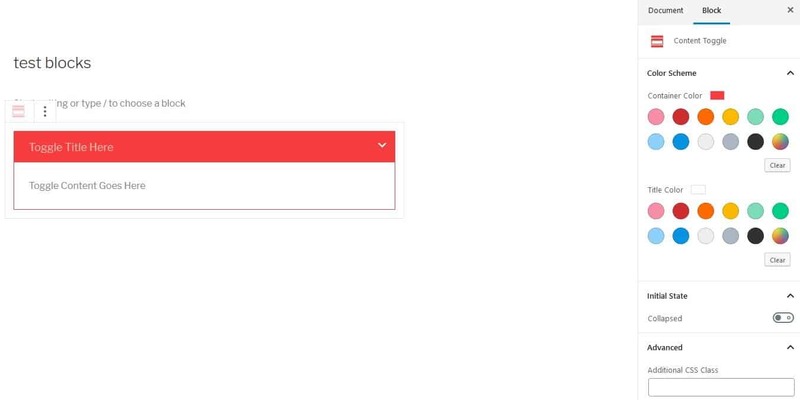 Similar to the number box, the feature box inserts up to three columns to your page. The main difference is the ability to insert images in the columns, which isn’t possible in the number box block. Again it’s best used when you want to emphasize certain key elements and make them pop from the rest of the page/post. 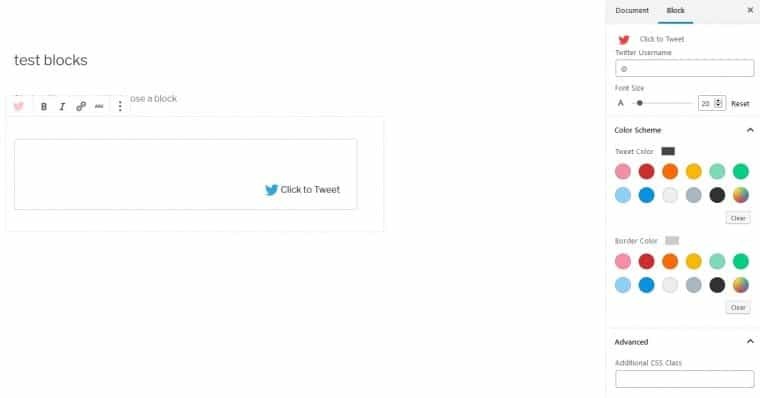 If you or your site are using Twitter as a promotional tool, you can add this block that will let your visitors instantly tweet and share the content you put up. Needless to say, you want your content to be available to as many people as possible. If Twitter isn’t the only social media app you’re using (and if you want to succeed on the market it shouldn’t be) you’ll want to add this social media block to all your posts. With just one click all your visitors will be linked to your social media pages where they’ll be able to follow, subscribe etc. In this day and age one of the most crucial blocks you’ll need. 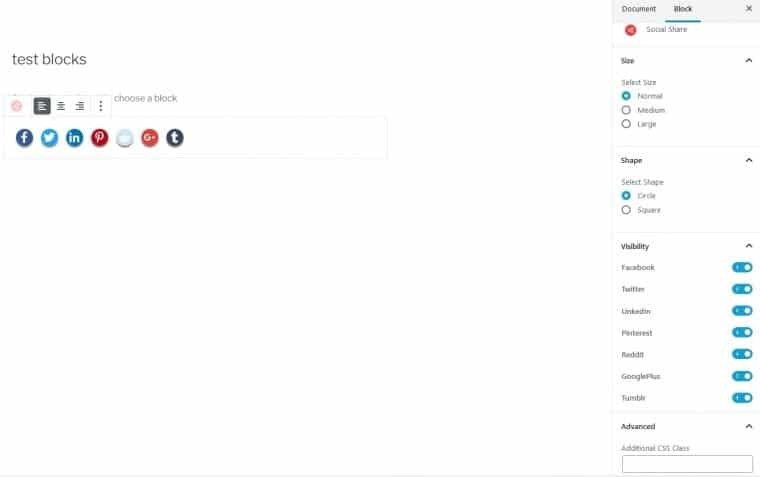 If you want something to be hidden on your page and then revealed only when needed, then this block will be the one to use. A good example of when to use it is the FAQ section of a page. At first only the questions are visible, but as you click on them the answer appears. When a simple link just isn’t enough you can always use a button that no visitor will be able to miss. We recommend using this block sparsely, else you risk overuse, which in turn defeats the purpose of it. If you have something important to point out (like a “buy here” link) a button is a great tool, but put five buttons on a page and they’ll essentially cancel each other out. Much like its name implies this block is used to create a section where you can cycle through tabs. It can be used in instances where your content consists of several parts that make up a greater whole. With this, each part can have its singular tab, while at the same time visibly being part of an overlying greater section. The star rating block gives your visitors an option to provide feedback to you and other visitors about the quality of a product, article, or any other content you’re putting up. In a culture where everyone wants their opinion to be heard, average ratings (or in this case stars) will make you sink or swim. While it is important to give your visitors the opportunity to have their say, it’s even more important to keep those ratings up. If you’re running big pages will loads of content it prudent to create a table of contents for your visitors to browse through it all more easily. 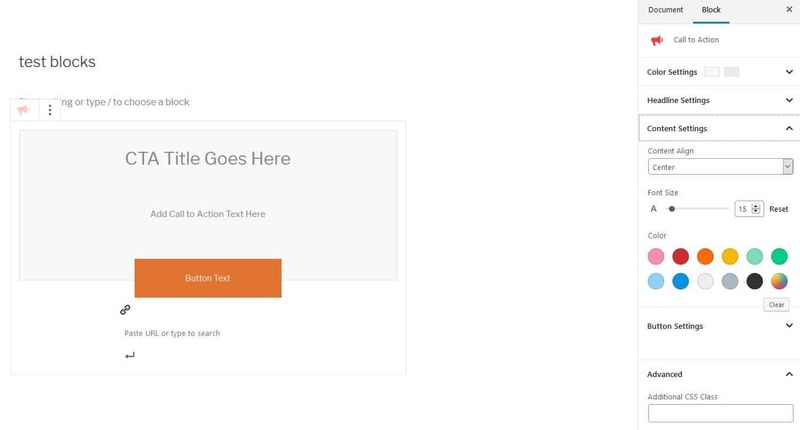 With this block, every header you put in your page will automaticity be added to the table and will link to a specific section once clicked on. It may seem like a small thing, but having to scroll up and down continuously can become tedious. Create blocks with a progress bar that point out, visually, the completeness of a certain aspect of your page. 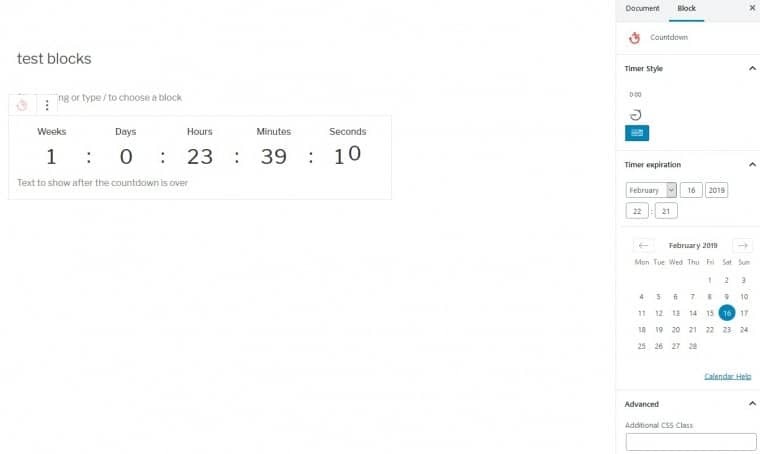 Insert a countdown timer to your page that tells your visitors when something is happening. This feature is best used when preparing a big event or launch of a new product or service. It will get the attention of your visitors and keep them engaged for the upcoming reveal. 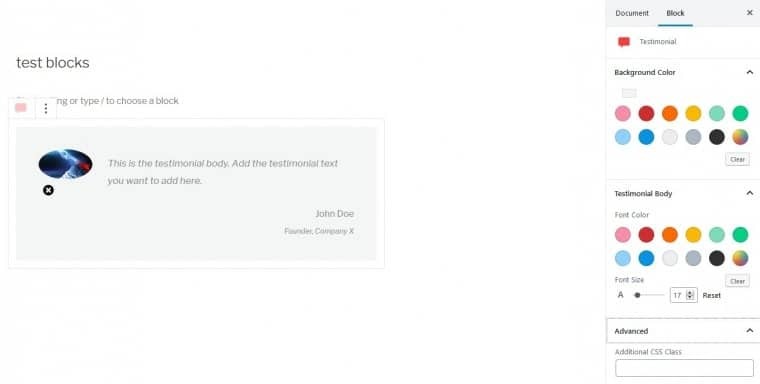 The review block presents you with a great final touch that comes after the written content you’ve published. 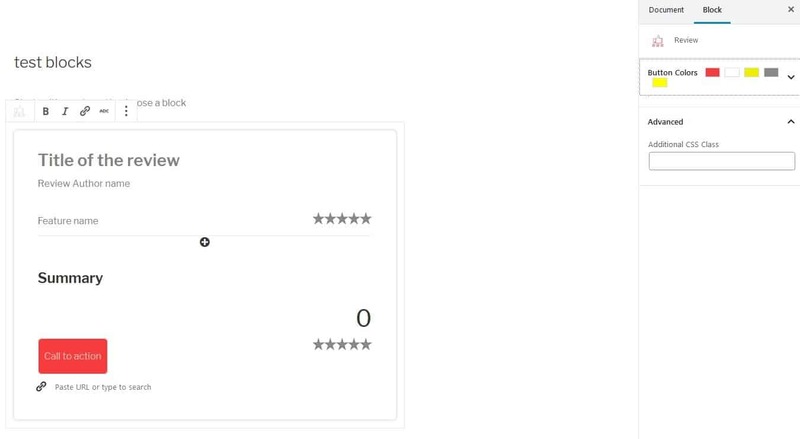 It gives you the option to sum everything up and give a rating to specific aspects and a final, total rating. Great for sites that publish reviews. As you can see in all the screens right now block editing consists of changing the colors, font styles and adding images and links. On first glance, this might not seem like much, but all the blocks are well imagined and work as is, so there really isn’t any need for additional editing. For more advanced users you’ll also have the ability to implement additional CSS classes to all blocks, making them even more unique. Getting used to a new process of managing and editing your site or blog can be challenging, especially if it’s such a big concept change as this one. Fortunately, plugins like Ultimate Blocks make the transition much easier. Being really simple to use it will mean you’ll get into it much more quickly and after you’ve got your handle on the basics it’s just a matter of taking the further steps to make your pages/post even better. As of right now, the classic WordPress editor is here to stay through 2020. which gives you enough time to prepare, however you do need to be looking forward and making the transition to block editing sooner rather than later. Exactly in this transition is where Ultimate blocks will shine. Published on February 11, 2019 by Matej Milohnoja; modified on February 12, 2019. Filed under: gutenberg.